This series was established by Walter Vitt in 1993 and is edited by him in collaboration with the German section of the International Art Critics Association AICA. Each volume (in German) is limited to 48 pages, is an »afternoon's reading« so to speak. The series is to be understood as an alternative program to the mammoth catalogues of a certain exhibition practice currently in place. Preferably members of the German AICA section are invited as authors. The topics address are appropriate to the current discourse in art criticism. Particular importance is shown the presentation of the small booklet. For the covers, the collaboration of the Braunschweig painter and art professor Lienhard von Monkiewitsch was won. His system of composition and construction »with square, parallelogram and rectangle« is superbly suited to an imaginative further development of the cover design. A continued collaboration with the painter is intended. 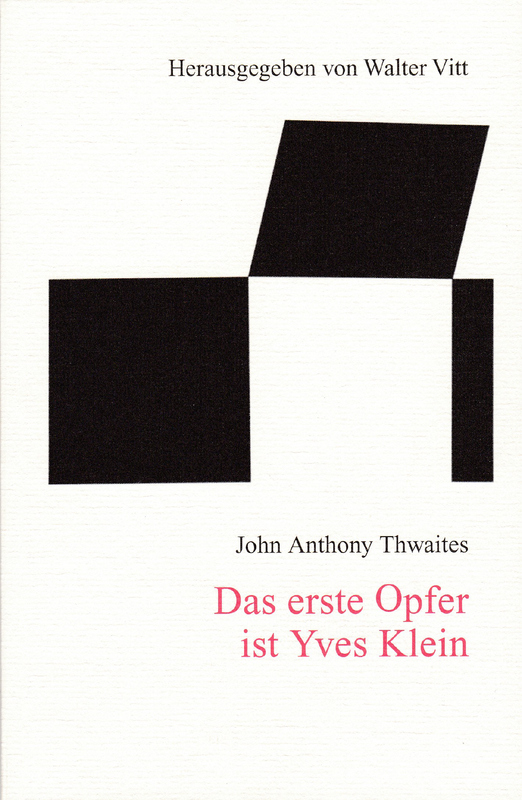 With occasionally very snappy British humor John Anthony Thwaites wrote his German reviews primarily for a broad audience. He wanted to educate them in recognizing creative art. Thwaites' comments are not free from self-contradictions, yet he was obviously read just because of his critical ratings, his humor and certainly also because of his polemical style. - eine „Frage der Schaufenster“? - a matter of showcase? For the second time, the publication series (Schriften-Reihe) is addressing the topic of “documenta”. Ten years ago Dirk Schwarze wrote a contribution entitled “Expansion of the documenta critique”. The current volume focuses on the beginning of this extensive exhibition in Kassel out of which emerged the Cologne contemporary art fair in 1967. The art fair itself was responsible for a wave of newly-founded art galleries. As a result of this development many other modern art fairs were launched worldwide. In this new edition, Barbara Hess, who has written her dissertation on this subject, deals with the early documenta exhibitions and their proximity to the market. Romain's essays from the cultural section of the social democratic newspaper "Vorwärts"
Before his career as an academic professor in Munich and finally as president of the Berlin University of Arts, Lothar Romain (1944-2005) has been an art critic in radio stations (Südwestfunk, Westdeutscher Rundfunk) and press („Vorwärts“). His articles, written at the end of the 1970s, are reflections on the further development of the awakening of fine arts in the final stage of the 60s. During this time, part of the official DDR-art found its lead off in Western Germany, especially with the documenta 6 (1977). His writing style is factual, informative, argumentative. He avoids the use of adulation in media, mailing and events of the art event manager. The spectacular discovery of modern art in the house of Cornelius Gurlitt in Munich and the partly helpless response at the beginning, respectively the later overreaction in parts of communication media – that is the subject of Andreas Hüneke’s essay. This is the third volume, for which our „art critic library“ has to say thank you to the Potsdam aica-member. The author himself finally said: In many cases was the early Gurlitt reporting nor balanced neither objective. The Genoese art historian Leo Lecci is primarily engaged in the early reception of Duchamp’s art. His essay was written on behalf of the publisher of the “Schriften zur Kunstkritik” (Writings on Art Criticism); the original Italian version has not yet been published. The profound impact of Duchamp’s ready-mades on the development of art in the 20th century has clearly been demonstrated. Duchamp himself has expressed “regret” in a subtle manner with the remark that his attempt failed to put an end to art once and for all. After her essay "Klee Conquers Italy" (volume 19 of the edition) the Genoese author explains the correlations between the Italian pittura metafisica and the German Magischer Realismus. Centre of her statement is the Roman art magazine "Valori Plastici", be published from 1918 to 1922 with 15 editions. In the nineties in France an extensive and heated discourse over contemporary art occurred. The authoress of this volume speaks of a „sort of balancing of accounts". Art market and art criticism, museums and collectors - according to the critics - had to an extent ennobled the decent of art into triviality. This volume documents the four early (1919) comments on Walter Gropius' Bauhaus conception. The articles written by Adolf Behne, Paul Klopfer, Max Osborn und Walter Müller-Wulckow are not present in Hans M. Wingler's comprehensive Bauhaus book edited in 1962. They represent models of an affirmative art critic. curating exhibitions, but also with art critic. The independent character of Klee's art remained largely lost to Italian art criticism of the 1920s and 1930s. Only after 1945, in war-torn Europe, was it finally recognized as an "alternative world which one can cling to" (Valenti). After „Wege der Kunstkritik" (Volume 8 / 1999), the author now deals with the current "condition" of the practice of art criticism. He comes to the conclusion that private collectors have taken over as the art world's opinion leaders, a position once held by art criticism. Art criticism is only used by its proponents. This volume documents the discussion at AICA's annual meeting in Cologne marking the beginning of Art Cologne 2006. As the person responsible for the Breker exhibition in Schwerin, Rudolf Conrades defends his project. Among the critics, the attitude is predominantly dismissive, to the point of theorizing that art history could do without the "Führer's" favorite sculptor. During the half century of its existence, the "documenta"
in Kassel has evolved from an art exhibition into a playing field for curators. The approach adopted by art critics has changed accordingly, now increasingly "taking on" the curators: critically, polemically, and even coarsely on occasion. Franz Marc - "Degenerate," but German. The second essay, after Hüneke's "The Case of Robert Scholz" (volume 11 of the edition), which deals with art reporting during the Hitler regime. The author documents the long years of indecision regarding the question as to if Marc in fact created "degenerate" images, or was a "German" artist. All his life, the painter Giorgio de Chirico wove himself into legends and mystifications. He also believed in them. Wieland Schmied pursues many of these legends and attempts, successfully, to solve the mystery of de Chirico. The author laments the numerous biographical and technical mistakes found in artists’ lexica and catalogs which, via uncritical reproduction, mutate into "truths" due to the frequency of their appearances. Vitt no longer trusts the reliability of lexicographic work in the field of the arts. To this day, many of the legends about Van Gogh which were "invented" by his first biographer, Julius Meier-Graefe, have managed to hold on in the literature about art. The author and editor plead for a critical approach to previous art texts. Robert Scholz was art critic for the »Völkischer Beobachter« during the Hitler regime, head of the Headquarters for Fine Art under the race-ideologist Rosenberg, and museum director in Halle. For him, it was clearly about »having a share in the power«, according to Andreas Hüneke. His texts about art followed the Nazi ideology - even after 1945. Albrecht Fabri sees art criticism as a complement to artwork. The critic is productive based on others' productivity, as long as others' productivity has left something open. The author deals with art criticism's far-reaching helplessness with regard to Appropriation Art, an art that - as with Sherrie Levine - openly appropriates existing art. Honnef rounds up his history of art criticism with the suggestion: criticism should not only deal with art-art but must also do this with visual culture in general. In this volume with texts on Beuys spanning over a decade, it is not an artist's development which is depicted but rather that of a critic and his changing argumentative positions. In Linfert's text from 1937 Hüneke recognizes his own camouflaged writings from the GDR era and frees the famous critic colleague from the fellow traveler's odium during the NS period. Hahne expects art critics to be capable of not verbally missing the subject. The correspondence of word and work structure is called for. Art criticism's overreaction is the striking characteristic of reception when it comes to Anselm Kiefer. Sabine Schütz investigates this polarity, taking international criticism into consideration as well. Feist's lecture deals with events that accompanied the second banning of the Avantgarde in Germany and depicts how politics in the GDR handled the creators of these »disruptive images«. Eduard Beaucamp supports the thesis that the Modern is dead and fundamental, radical changes in the visual arts are not to be expected.